The surprise discovery of the skeletons was made by Thames Valley Archaeological Services under the quadrangle at St John's College at the University of Oxford, before building work started on the site. The bodies had not received any type of formal burial and they had been dumped in a mass grave on the site of a 4,000-year-old Neolithic henge monument. Ceri Falys, an osteologist (a scientist who studies the structure of bones) from Thames Valley Archaeological Services, has been examining the bones since they were excavated. She has found a host of gruesome injuries on each of the individuals. It was obvious at the time of excavation that many of the skulls had been fractured or crushed, but after piecing these skulls back together, she found that many of them were covered in blade and puncture wounds mostly to the back of the head. One of the victims had puncture wounds to his pelvis that seem to have come from behind him and from the side, as well as substantial blade wounds to his skull, suggesting that he had been attacked from all sides by at least two different people. These injuries were almost certainly fatal in each case, slicing through flesh and arteries right to the bone. "Usually when people have been involved in hand to hand combat or are attacked you get evidence of this on the bones," Ceri Falys explained. It is possible that the Oxford skeletons were victims of an event called the St Brice's Day Massacre, recorded in a number of historical sources. In AD1002, the Saxon king Ethelred the Unready recorded in a charter that he ordered "a most just extermination" of all the Danes in England. He made the decision after he was told of a Danish plot to assassinate him. The charter also recorded how on that day, the Danes in Oxford fled to St Fridewides church expecting to find refuge, but instead were pursued by the townspeople, who then set the church on fire. 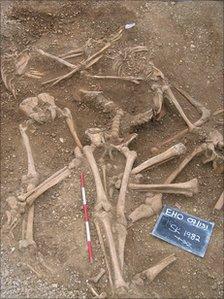 Radiocarbon dating of the bones indicated that the bodies were dumped between AD960 and AD1020. This is compelling evidence for the association with St Brice's Day, explained archaeologist Sean Wallis, who directed the dig. "We found evidence of charring on some of the bones, but not in the soil surrounding them. "This ties in nicely with the documentary sources that the bodies may have been partially burnt prior to burial," he said. Isotope analysis of the bones has shown that the men were eating a diet that was high in seafood. This is an unusual find considering that they lived in inland Britain and perhaps a further indication that they may have been first or second generation Vikings. 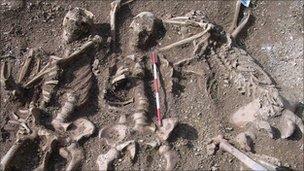 A similar mass grave was found last year by Oxford Archaeology during work to build the Weymouth relief road. It was radiocarbon dated to a similar period and again containing only young male victims, indicating that Anglo Saxon violence towards Vikings at the time may have been nationwide. 789 First recorded Viking attack at Portland in Dorset. Viking coastal raids continue in the following decades. 867 Vikings capture York and make it their capital, Yorvik. 878 Viking power extends south. King Alfred of Wessex is forced into exile but returns to agree a division of England with Vikings ruling the east. 937 Athelstan wins a decisive battle over combined armies of Vikings and Scots to become the first King of all England. Viking coastal raids continue. 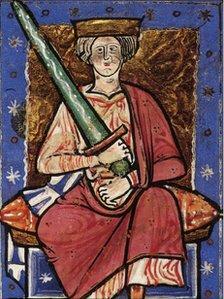 1002 Ethelred the Unready orders the extermination of all the Danes in England. 1013 King Sweyn of Denmark invades England and seizes the throne. The kingdom is disputed between Saxon and Danish kings over the following decades. * 1066 William the Conqueror invades and founds a new Norman dynasty.